Flame Busters is another amazing slot developed by a great company, Thunderkick. This developer is known all over the world because of the games it has been created over the years, which many of them have become highly popular amongst casinos and also players. You have the great opportunity to enjoy this slot at many online casinos, and win some money as well. Thunderkick did an incredible job when developing this slot, especially when it comes to the gameplay, which is just superb. Although the graphics are stunning, they have a 64-bit style. You have this slot with 5 reels and also 243 paylines, and these are the ways you can win. There is the possible to play it from only 10p to £100. This is the amount you can bet. 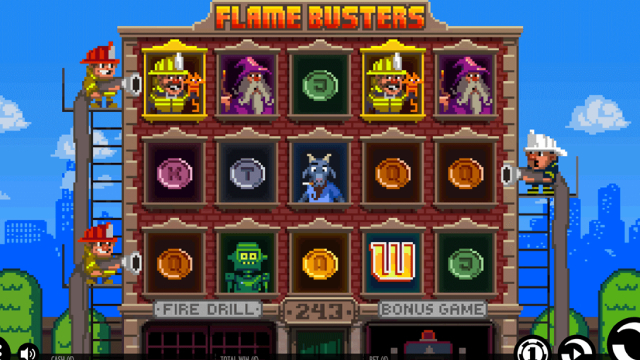 You can play Flame Busters using any smartphone or even any tablet you own, since it’s possible to play it through any device, whether it’s an iOS or an Android device. This gives you the possibility of playing anywhere and anytime you want, making it very accessible for anyone, since you can play it by just having wi-fi or data connection. The slot is all about fire, so it’s only natural that the reels are actually the windows of a building burning and there are several firefighters on ladders that are trying to fight with it. Below the building there is a fire department. When it comes to the visual and to the design of Flame Busters, it looks like a Nintendo game since it has the same type of graphics they had back then, and that’s a good way to remember 1986. The graphics have an arcade feel, but that’s something many players look for, so it’s not a disadvantage. It actually can attract more players by having this type of graphics. You have some bonuses games that you can benefit from in order to win some money, and that’s essential and why many people look for good slots. It’s obvious that if you want to get a good payout, then you should also make a good bet, so that you can also receive a lot of money. If that’s something important to you, then you can bet the maximum of £100. 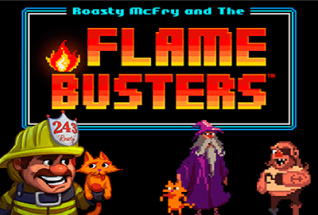 In Flame Busters, you have the incredible possibility of winning 5,280 times your bet, and that’d not be a low payout. This slot is about fire fighters who try to help people in a building on fire. The windows of the building are actually the symbols, and they are reaching for the help of the professionals. They are seen on the side of the building on ladders, and trying to get to the people there. The symbols of this slot are very simples, but are also pixelated. You have coins like the ones you had on Mario Brothers, such as the A, K, Q, J and T. There is also a wizard, robot, goatboy, pirate, and McFry holding a cat. The last one is actually the symbol with the highest value and it can give you 10x your total stake when 5 of them appear randomly on a payline. You also have the fire symbol, and that is a mystery symbol and it is able to be replaced by other symbols, but not the wild and scatter, obviously. The W is the wild symbol and it can replace any other symbols but not the scatter. The Alarm Bell is the scatter symbol, and if you land 3 or more of them then you will trigger the bonus game feature. 3 of these reward you with 10 free spins, 4 of them reward you with 15, and you can also land 5 of them you can get 20 free spins. 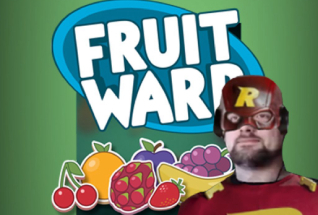 This is really good, and if you’re lucky enough, you can get the 20 free spins and take advantage of them. The symbols are collected in a specific way, upwards the building. When you have 3 scatters collected, then a floor will be unlocked giving you 2 free spins. 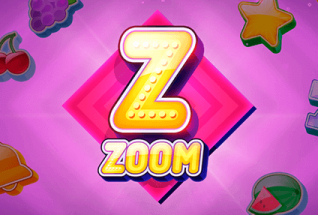 There is the total of 5 levels, meaning you can get 10 free spins. Every floor that is unlocked is able to trigger the Coin Ignition bonus. Whenever it happens, then the coin with the lowest value will turn into a fire symbol for the rest of the bonus. If you reach level 5, then all 5 coins become fire symbols and then they will turn themselves into other symbols (expect the wild and scatter) meaning you can get better payouts, which is always good. There is also a fire drill feature that can be triggered randomly. When this is activated then between 1 to 5 of the low coins will become fire symbols, changing into others symbols, something that can really give you a better win. There are also free spins, and you can always trigger them. 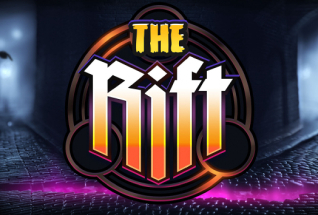 You have 20 free spins available on this slot, and you can really get something out of them. Flame Busters is a slot all about fire and fire fighters, and you can benefit from the features it has, since they can really result in great payouts that you get. You have free spins and you also have fire symbols. This slot has the same style of graphics as the Nintendo back in the 1970’s, but it is very attractive, especially because of the theme, since it’s very peculiar.